When the description is more interesting than the session, conference goers skip out to search for swag. This year’s ACP conference was swag deficient. Perhaps the hasty relocation to Kansas City from New Orleans caused vendors to scale back their presence, if they even showed up at all. However for every item we pass up, someone back home will want it. I knew a copy editor who loved media pens. She squealed like it was Christmas morning when I returned from the ACP conference in Orlando with a 25 pens – all for her. On the final day of that conference, I asked conference organizers for extra name badges. They served our staff as reporting kits. They held our press passes, reporter’s notebooks, pens, and business cards. 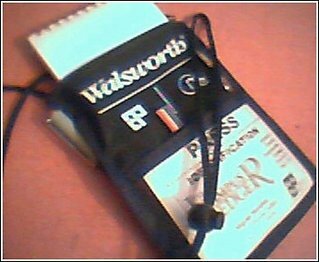 A veteran of the journalism conference circuit, I’ve inadvertently started collecting reporters notebooks. I have about 75. Occasionally, I dig into my bag of swag and give a staffer a gift from the media gods. For many, a Knight-Ridder hacky sack or New York Times coffee mug goes a long way when it’s accompanied by praise for a job well done. Many journalists have problems with the ethics of accepting swag, as they should. Don't trade your integrity for an iPod. Staff manuals should contain a code of ethics addressing gifts. If there's any question about accepting swag -- don't. My theory is that the praise accompanying the re-gifted swag is the real value. Staffers don't care about the “Rent” poster or the pen from the Associated Press. Just as you never know what’s going to send a staff member over the edge, you never know what’s going to put a smile on his or her face. Before throwing away share the wealth while offering praise. 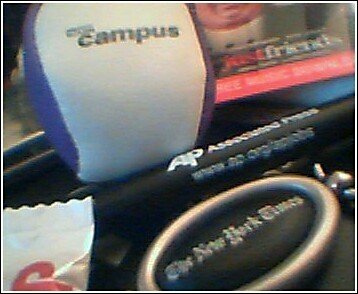 For those who attended the blogging session at the Associated Collegiate Press & College Media Adviser conference in Kansas City, Mo., here are the sites I mentioned in my presentation. Steve Buttry's "Training Tracks," originated on the No Train, No Gain website. Now his blog comes from the American Press Institute (API) website and is mirrored on NTGNG, which also houses the archives. Steve welcomes e-mail from student journalists and compiled a list of newscoaches across the country willing to visit college newsrooms. For the CD ROM, Steve will send a disk of his handouts, which I've used in my newsroom and as a freelance journalist for The Kansas City Star. Speaking of API, its Media Center Blog, morph, offers insight on convergence, new media and seeks innovation in storytelling. It strives to create a forum for guest bloggers. One of my favorites simply because of the name is Grumpy Old Editor from the Observer-Reporter (Washington, Penn.) Grump A.K.A. Park Burroughs, offers insight into the reporting and editing process while combining the infamous quality editors have in excess. Student grumps will admire his random complaint in The Day's Gripe. Read freelance journalist Bob Baker's experiment in using blog-style in print as he profiled a blogger. Copy Editors, or those who want to understand them, should visit Testy Copy Editor. Most of the discussion takes place on the site's message boards because most of the copy editors hate that journalists abandon style and grammar when blogging. The largest list of journalism blogs comes from CyberJournalist.Net. The list contains ongoing and limited blogs from news sites as well as journalists' personal and professional blogs. Of course, check out my Journalism Links on the right side of this page for other journalism sites that have created blogs and pod ... er ... nanocasting. Also feel free to e-mail me about a specific issue and I'll devote a TIME OUT topic to it. "You're not the boss of me." That phrase or one similar is said everyday in student and professional newsrooms across the country. Sometimes our small newsroom staffers wonder, "Who is the boss of me?" In a perfect newsroom, the staff manual would define roles and responsibilities. However when it comes to staff manuals, usually the only people who read them are the people who wrote them. When on the quick and dirty, staffers don't follow the newsroom organizational chart, they follow the power structure -- they aren't the same. Staffers gravitate to people who help, ignore those who can't and avoid those who impede. Do you help others without taking over their projects? Are you frustrated at being ignored because you don't have answers and consequently don't have answers because you're constantly ignored? Does your passive-aggressive nature cause you to block the success of yourself and others?